An employee was using compressed air to clear debris off a trailer’s brake shoes. The work created a small cloud of airborne dust, which drew the attention of other employees. A lab analysis confirmed the brake material contained 20% to 30% chrysotile asbestos – the most common form of asbestos. Automotive materials such as brake shoes, brake pads and clutch plates may contain asbestos. When employers are unsure if these products contain asbestos, they must implement control measures to protect employees as per the requirements of Regulation 92-106 (Working with Material Containing Asbestos). It requires the development of a code of practice for Class 1 or low-risk work. 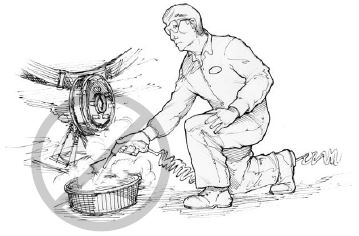 Auto mechanics who perform brake and clutch repairs risk exposure to dust that may contain asbestos fibres. Once suspended in the air, asbestos fibres can be inhaled. Prolonged exposure to asbestos dust can cause chronic lung disease or lung cancer. Before beginning work, remove all visible dust from all surfaces using a damp cloth or a vacuum equipped with a HEPA filter. Control the spread of asbestos dust away from the work area using drop sheets of polyethylene or other suitable material. Before starting work, wet all asbestos-containing material unless wetting causes a hazard. During the work, frequently clean up any dust or waste containing asbestos using a damp cloth or a vacuum equipped with a HEPA filter. Do not use compressed air hoses or brushes to clean up dust. Provide NIOSH-approved N95 respirators (or better) to employees. Dispose of waste material containing asbestos according to the requirements of the New Brunswick Department of the Environment and Local Government. Transport waste material containing asbestos following the requirements of the Transportation of Dangerous Goods Act. Never use compressed air to remove dust from automotive friction materials. Even if the employee shown here was wearing a respirator, others would still be exposed to airborne asbestos dust.